Rebecca Shepherd floral design: Spring wedding at the Green Building in Brooklyn. Spring wedding at the Green Building in Brooklyn. 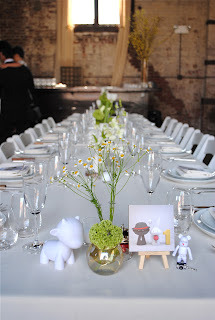 This wedding took place on April 8th, 2012 at the lovely Green Building in Brooklyn. The couple was incredibly creative and did so much work leading up to their big day. They designed little figurines which represented themselves at a rabbit and a monkey (: Of course, we may boutonnieres out of them! The tables were all long and the food was served buffet style by Frankie 457. (LOVE) The couple supplied me with a hefty bag full of little chochques, toys, figurines, and even a green stuffed bear. We used an assortment of containers including white milk bottles, vintage and new clear glass and mixed some quintessential spring flowers like tulips, vibrunum, narcissus, and chamomile. Overall the flowers were VERY simple, clean, and crisp. The most fun we adding in all the little fun toys into the table scape which sort of made them come alive (: You can see more on my floral Facebook page HERE. Deep purple wedding in NYC!